2008 marked the introduction of bitcoin, and with it the emergence of the underlying technology – blockchain. Since then, not a day has passed where there has not been an intense debate on the potential of blockchain in banking – be it at a conference, webinar, social, or digital platforms. These debates have made their way to the board rooms of both, global and regional banks. According to World Economic Forum, more than ninety central banks have engaged in distributed ledger technology discussions worldwide. Ninety plus corporations have joined a blockchain consortia, and more than 2,500 patents have been filed in the last three years. All these debates and discussions have created a huge hype around blockchain. But the ground reality is a bit removed from this hype and has a more measured approach; while banking technology leaders are convinced that blockchain will be foundational for the future of banking, few have found answers to questions surrounding the practical implementation of this technology. 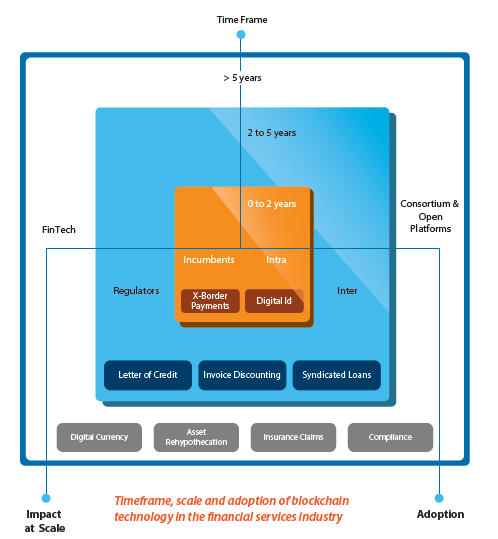 The joint research by Infosys Finacle and Let’s Talk Payments (LTP) (surveying more than hundred business and technology leaders from over seventy-five financial institutions) was conceived to answer all these questions and provide some clarity to banks looking for a blockchain adoption strategy. While 50 percent of the respondents in our survey indicated that they are waiting for the technology to reach a more mature stage, about 35 percent identified business cases for blockchain that are suitable for their organizational strategy and are looking to invest in the near future. 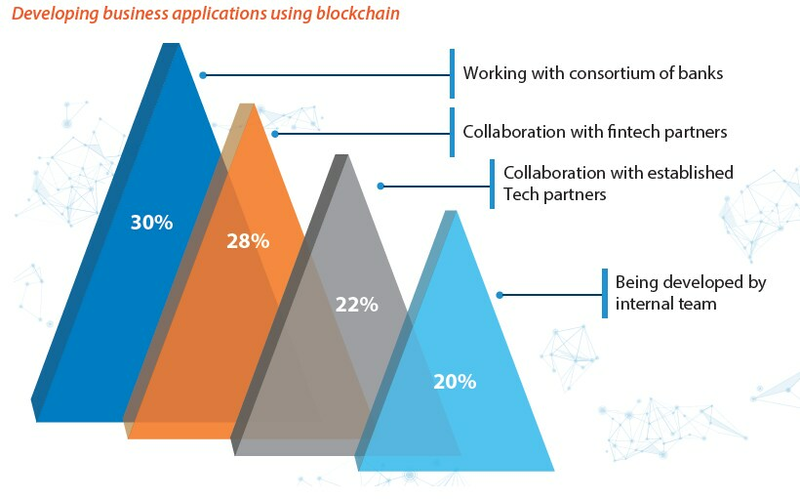 About 15 percent, who are classified as true innovators, have already started blockchain initiatives in full scale with either dedicated teams, or through partnerships with technology startups or companies. Investments in blockchain projects in 2017 is expected to be US$1 million on an average. Innovators have already invested funds over US$10 million to support blockchain initiatives, and also explore use cases beyond the traditional realms of cross-border remittances, clearing, and settlement. Many banks are still exploring how to effectively use blockchain to leverage its benefits that are relevant to their business. It is in the banks’ best interest to start small, experiment with the technology in a controlled environment to discover the value it can add to their business; and only then commit towards production deployments. An example of a successful blockchain pilot is the one implemented by ICICI Bank Limited, India’s largest private sector bank by consolidated assets, and Emirates NBD, the leading banking group in Middle East, using the EdgeVerve Blockchain Framework. Banks have the option of choosing between public, private and hybrid blockchain for adoption. The public model completely decentralizes the consensus process, allowing anyone to join the blockchain network. Hybrid is the intermediate type of distributed ledger, seen in consortiums where the consensus process is controlled by a preselected set of nodes. Finally, the private blockchain allows the bank to define and restrict the rights to few users. Our research only reiterated the most popular blockchain adoption methodology for banks, which is private permissioned blockchain. A clear majority of 69 percent of the banks were in its favor. This seems to be a natural choice as the security of customer and transactional data is paramount for banks. Private blockchains also provide an added advantage of greater flexibility, dependability, and adaptability compared to public blockchain infrastructure. 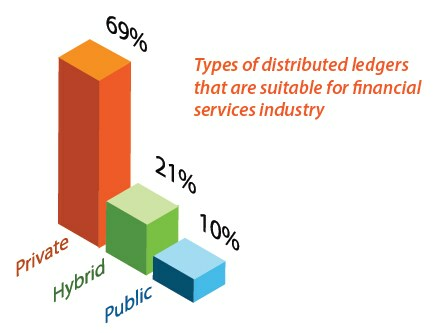 About 21 percent of banks are choosing to adopt, or planning to rather to go forward with hybrid blockchain. But with the operational risks and security concerns, it does seem that private blockchain is a safer option. Another popular choice for blockchain adoption is the partnerships route. About 50 percent of banks are either working with a fintech startup or technology company to augment their blockchain capabilities, while another 30 percent are opting for the consortium model. This is a good option for banks that are burdened with legacy technology infrastructure and lack in-house talent required for blockchain implementation. The World Economic Forum (WEF) has identified blockchain technology as one of its six mega-trends in a report aimed at defining the impact of software advancements on the digitally connected society of today. In this survey, 58 percent of the respondents expect that 10 percent of global gross domestic product (GDP) would be stored on a blockchain by 2025. However, the groundwork for commercial blockchain adoption will be laid out much earlier. According to the Infosys Finacle – LTP blockchain report, one in every three banks expects to see commercial adoption by 2018, while 50 percent of the surveyed banks expected to see commercial adoption only by 2020. 2017 will see a race to production among progressive banks, albeit in a small way and for simple use-cases. The top use cases chosen by banks for implementation include the usual suspects, such as cross-border payments, digital identity and clearing & settlement. These are closely followed by line of business use cases like invoice management and letter of credit, and these use-cases round out the top five blockchain implementation priorities for banks. However, as with any technology implementation, banks will have to move forward judiciously. Banks should take into account their current business requirements and map out the areas where blockchain can help. Based on the outcomes of this research, banks should create an objective roadmap for blockchain implementation. It is important for banks to consider the fact that while blockchain offers a lot of opportunities in cross-industry and cross-functional collaboration, it is up to the bank to determine the area where blockchain fits best in their transformation strategy. We believe that only after banks have taken all of these factors into account, they should initiate efforts to apply the technology in real-world processes. The research has helped us to lay out a logical progression plan of use case implementation as shown in the diagram below. The first use cases that will see the light of the day in the next couple of years are intra bank use cases, or use cases, which can be tested with incumbent inter-bank relationships. These are most likely to be in the common areas of digital identification and cross border payments. The next 2-5 years will see more of inter-bank use cases, and cases that involve regulators – such as trade finance. Beyond five years, there will be widespread adoption of this technology in the financial services and banking ecosystem. By 2020, the adoption of blockchain based applications will increase in several businesses outside of the financial services industry. The larger part of the ecosystem adopting this technology will include players like the government, corporations from other industries, and possibly even end consumers. It is at this point that the true potential of blockchain technology will be truly realized as a key driver for business transformation. Based on the findings of this report, it is no longer a question of whether banks will adopt blockchain; but more of when and how they will implement it. This research reaffirms our belief that banks must experiment with the technology in a controlled environment, in the form of pilots, to discover the value it can bring to their business. Banks should take measured steps based on the outcomes of these pilots to commit towards production deployments for blockchain. We hope banks will find this report insightful while crafting their organization’s blockchain adoption strategy.